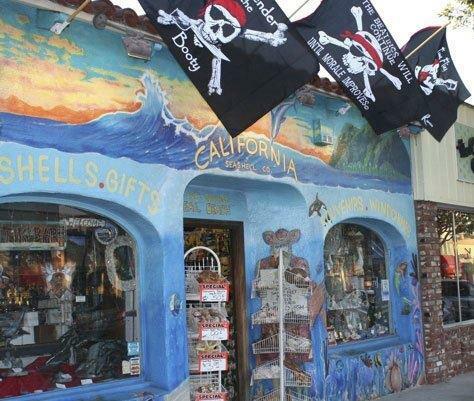 Celebrating its 20th anniversary in Seal Beach, California Seashell Company’s souvenir and shell shop has become a must-see tourist stop and local favorite. The Main Street store has been around for much longer though. It was originally established by Harry Condo in 1952. When Condo passed away in 1992, John Haney bought the fellow shell enthusiast’s shop. After years of selling at the Orange County swap meet he opened California Seashell Company’s first retail storefront. The store caters to both vacationers and Orange County, CA residents alike. With aisles upon aisles of seashells, starfish and coral, the selection doesn’t stop there. Souvenirs range from seashell magnets, surfboard keychains and coffee mugs, to novelty California license plates and nostalgic metal signs. California Seashell Company also stays up-to-date with the many nautical and beach home decor trends, some of which include wind chimes, lanterns and nautical buoys. And, let’s not forget their hand-crafted Starfish Beach People and Glittered Ornaments. John, along with his wife Lisa, has since expanded the company to an additional shop in Five Points Plaza and wholesale warehouse, both located in Huntington Beach. The company is mainly a family-run business with many extended family members employed throughout the retail and wholesale locations. Located at 125 Main Street, Seal Beach, CA 90740, the current summer hours for the Seal Beach store are 10am to 9pm, seven days a week. If you can’t make the trip to California, they have also more recently expanded to serving beach-lovers everywhere with their online store at www.CASeashells.com. Come and visit this Seal Beach landmark, you won’t be disappointed. And, no matter how much money you have in your pocket, there is always something affordable for everyone, even the tiniest of shoppers.